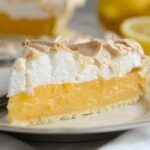 This is the best lemon meringue pie recipe ever! Ever!!!! With instructions on how to make shortcrust pastry or pie crust. No kidding! I have never had a better one, this lemon meringue pie is just out of this world. 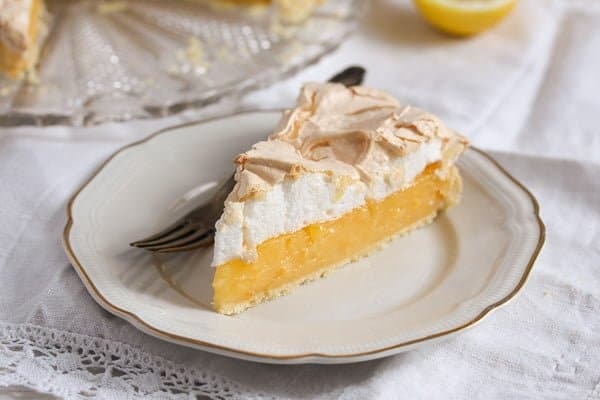 Lemon pie, any kind of lemon pie, with or without the meringue, is my favorite kind of pie. So, you can imagine that, over the years, I have baked and eaten quite a few different versions of a lemon meringue pie. 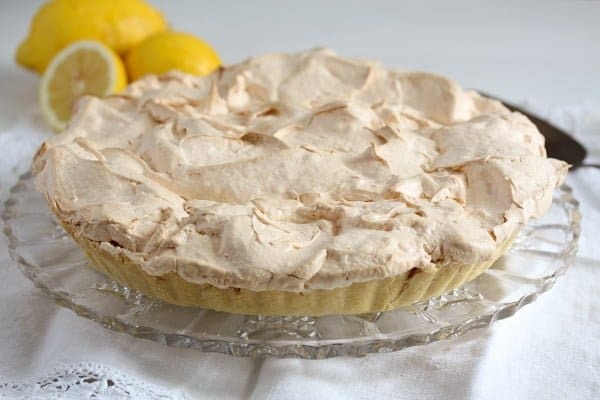 But now, that time of ever trying out new lemon meringue pie recipes is over, I don’t think I will want to try another lemon meringue pie recipe ever again! No other recipe can beat this one! I baked this lemon meringue pie for the first time more than half a year ago. I had actually baked another lemon meringue pie shortly before and even took some pictures, but although the pie was rather good as well, the pictures were just awful. The pie was flat, the lemon pie filling tasty but rather runny, the crust too crumbly. Good enough to eat, but not as good as something that I like to post on the blog. And then, during my Harry Potter cooking and baking months (for a firm selling Harry Potter geeky stuff), I baked this particular lemon meringue pie – the best lemon meringue pie ever ever!!! 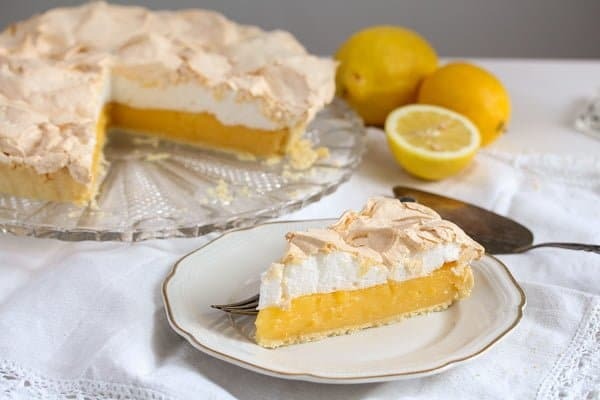 Harry’s aunt Petunia bakes this lemon pie in the third book of the series – Harry Potter and the Prisoner of Azkaban to serve it to Vernon’s sister, aunt Marge. The crust for the lemon meringue pie is regular, basic shortcrust pastry. Very easy to make and always delicious. Very important when making shortcrust pastry is to make sure that the butter you use is very cold. This will help the pie crust become really nice and flaky as the fat (butter or even lard) will not be completely worked into the dough. I always use butter taken directly out of the fridge and if I have some spare minutes (and I happen to think about it), I cut the butter into small cubes and freeze the cubes for 10 – 15 minutes before starting to make the dough. Especially a good idea if you are making pie crust in the summer. So, that is very important as well, don’t over mix the butter into the flour. 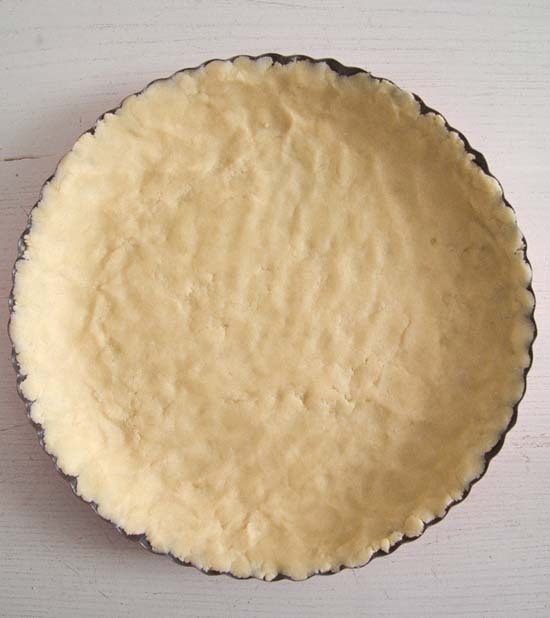 After mixing the flour and the butter, the mixture should resemble breadcrumbs, but it is desirable to have a few larger pieces of butter in the dough as well, they will ensure that your pie crust gets flaky. 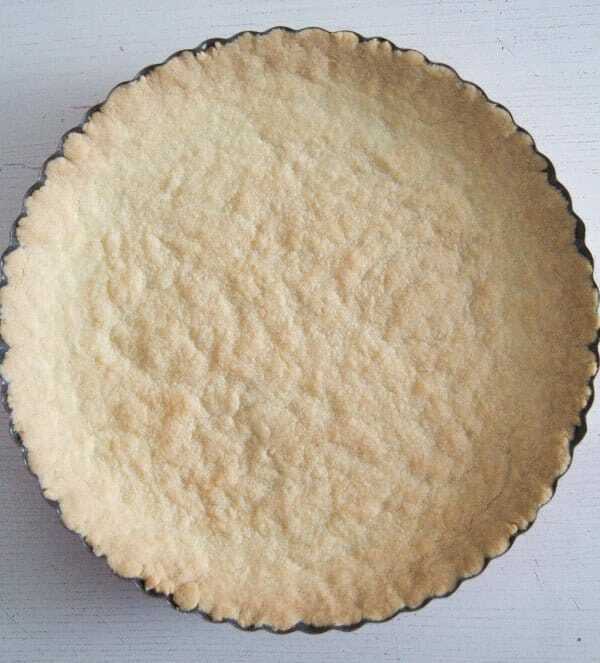 When making shortcrust pastry you will need a little amount of water to help the gluten in the dough develop and thus help the dough keep together. However, it is important to add only a very small amount of water, in this case no more than 2 tablespoons. I used regular tablespoons, the one you use when eating soup for instance and not those used when measuring other baking ingredients, I suspect they hold a bit more water than soup tablespoons. Only add about 1 tablespoon water first and the rest, little by little, if necessary. You should add enough water to make the dough hold together when pinched between the fingers. The water should be very cold as well. You can make shortcrust pastry either by hand or with a food processor. Using a food processor makes things faster and easier and also ensures that the fat will not get too warm and overworked. When using a food processor, give the flour to the food processor. Add the very cold butter cubes and the very cold water and pulse or mix rather shortly. My Thermomix needs about 30 seconds at level 4. Just pulse until the mixture resembles breadcrumbs, then stop immediately. If you make the pastry by hand you have to make sure that the fat will not get too warm. You can either cut the butter into the flour using a knife or rub the butter into the flour with your fingertips. If you do that, make sure that your hands are cold (keep them shortly under cold water) and only use your fingertips as the palms of your hands are much warmer. After rubbing in the butter add the water a little at a time until the dough holds together when pinched between the fingers. After making the dough, give it to a floured surface. Quickly, form a flat disc, wrap it in cling film/plastic wrap. Forming a disc, rather than a ball, will make it easier for you to roll the pastry later, without getting too many cracks around the edges. Refrigerate the dough for about 30 minutes. You can make the dough one or two days in advance as well and keep it in the fridge or you can even freeze the dough discs at this point. Roll the dough on a well floured surface and don’t forget to flour the rolling pin as well. Pass the rolling pin over the dough, turn the circle a little bit and pass again with the rolling pin. Continue turning and passing until you have a circle of dough slightly larger than the pie dish you are using. If the dough threatens to stick to the working surface, lift it slightly and sprinkle a little extra flour underneath. Carefully transfer the dough to the pie dish. Easiest way to do that is to wrap the dough lightly over the rolling pin and then carefully let it unfold and fall into the baking dish. Press lightly with your fingertips to help it get into the dish in an even layer. Press the edges lightly as well. Make sure you use organic lemons as you will need their zest as well. Even if they are organic, wash the lemons very well with hot water and a little soap before zesting them. Zest the lemons finely using a fine grater and making absolutely sure you only grate the yellow parts of the zest, the white parts are very bitter. Juice the lemons, you will need 240 ml/8.1 fl.oz/ 1 cup lemon juice. Separate the eggs and keep 4 egg whites for the meringue. Give the cornflour and sugar to a saucepan, gradually whisk in the lemon juice and the water. Cook over medium heat, stirring constantly, until the mixture is thickened and smooth, it will take about 7 minutes. Once it bubbles remove from the heat and beat in the cubed butter. When the butter is melted, add the whole egg, whisk it in very well and return the mixture to the heat. Keep stirring well until the mixture thickens, it will take about 2-3 minutes. Set aside. You will make the meringue using the reserved 4 eggs whites. Whisk until you get soft peaks. Add about ½ of the sugar, one tablespoon at a time, then whisk in the cornflour. Add the remaining sugar, one tablespoon at a time, and whisk until the meringue is thick and smooth. I prefer to use a loose-bottom pie dish when baking pies. A regular one works as well, but a loose-bottom one just makes things so much easier. Getting the pie out of the dish is a piece of cake. If you use a regular pie dish, you might want to serve the pie directly out of the dish. First you will need to bake the pie crust blind. In order to do that, place a piece of baking paper on top of the crust and top the crust with dried beans. Bake the pastry case blind for 15 minutes. Remove the beans and the paper and continue baking for 5 to 8 minutes or until the pastry case is golden. When the pastry crust is baked, lower the heat to 180 degrees Celsius/ 360 degrees Fahrenheit. Pour the lemon filling into the pastry case. Put spoonfuls of meringue around the edge of the filling, spread it nicely and give the rest of the meringue into the center of the pie, spreading it so that it touches the hot filling surface. Give it a swirl to make it look nice. Bake for 18-20 minutes until slightly colored and crispy. Let the pie sit in the tin for about 30 minutes, remove it carefully and let it cool and set for about 1 hour before slicing. The pie is at its best when served on the same day. Give the flour and salt to a food processor, mix and add the cubed and very cold butter. Process until the mixture resembles breadcrumbs. Add the cold water, little by little, and stir very briefly until the mixture just comes together, the dough should hold together if you pinch a little between your fingers. Turn the mixture onto the working surface and knead very shortly to form a ball. Press the ball into a disc, wrap it in cling film and refrigerate for 30 minutes. Roll the pastry on a lightly floured surface and line a 23x2,5 cm/ 9x1 inch loose-bottom fluted flan tin. Press the pastry into the flutes, if it cracks just press it back together. Place a piece of baking paper on top and fill the tin with dried beans. Bake the pastry case blind for 15 minutes. Remove the beans and the paper and continue baking for 5 to 8 minutes or until the pastry case is golden. When the pie crust is baked, lower the heat to 180 degrees Celsius/ 360 degrees Fahrenheit. While the pastry case is baking, make the filling. Wash and dry the lemons, zest them all, making sure you only grate the yellow parts and none of the white pit (that is very bitter). Juice them to obtain 240 ml/ 1 cup lemon juice. Separate the eggs and keep 4 egg whites for the meringue. Give the 4 reserved egg whites to a large bowl. Whisk until you get soft peaks. Add about ½ of the sugar, one tablespoon at a time, then whisk in the cornflour. Add the remaining sugar, one tablespoon at a time, and whisk until the meringue is thick and smooth. Pour the lemon filling into the pastry case. Put spoonfuls of meringue around the edge of the filling, spread it nicely and give the rest of the meringue to the center of the pie, spreading it so that it touches the hot filling surface. Give a swirl to make it look nice. It looks amazing. 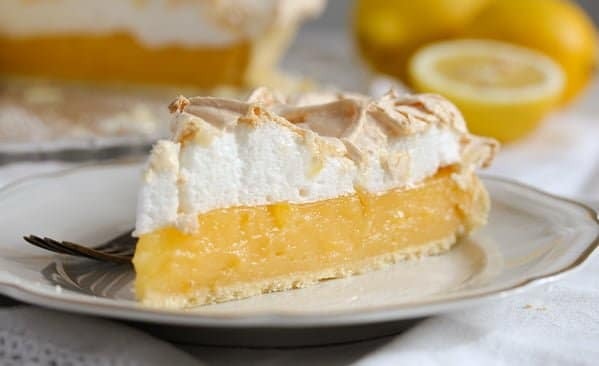 I do love lemon meringue pie, is one of my favourite desserts. That looks amazing, Adina. The lemon filling has a perfect consistency. Excellent! This pie is out of the world.. perfect texture.. Perfect festive treat .. how are you??? came here after log time as i was on the vacation.. 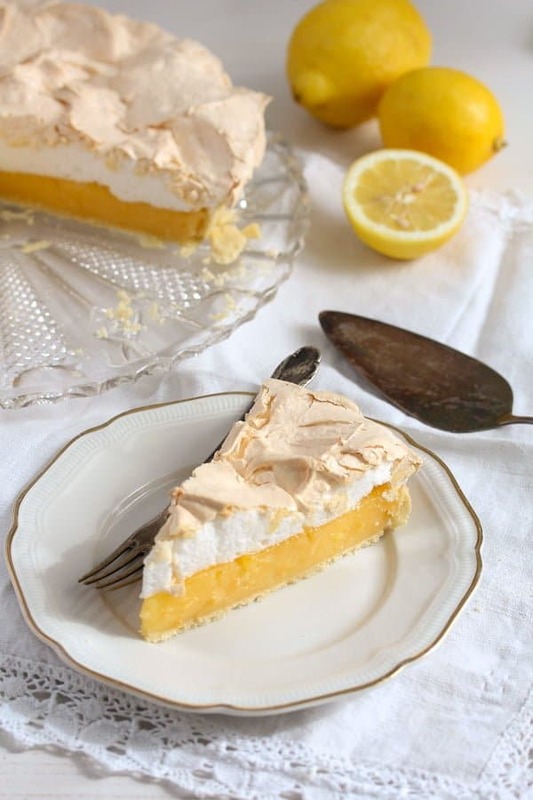 This does look like the perfect lemon meringue pie! My mother made a good one, but as an adult I now find it too sweet, so I don’t make it anymore. I love these pies so yours looks like the one I should be making. Thanks for sharing!